True fantasy is a lost art in the modern age, only to be found in the nooks and crannies of the world. Yes, there is fantasy, that pseudo-medieval world inhabited by orcs, elves and dragons, but I am speaking of the fantastic. Not the hyped, or the over-glorified, but the subtle, the strange, the vivid, and the mystical. One modern example is to be found in the webcomic world, a thick forest of imagination that by now has reached an age where there's old growth. Not necessarily in the age of the comic itself, but where creativity has spread its gnarled roots. Sara Valta's Alchemilla is the delightfully wet mat of leaves that coat the forest floor in the autumn, turning into mulch underfoot and floating odors most pungent through the nostrils. Well, depends on where you live; that doesn't happen around here, although I *have* had the pleasure of visiting a friend's family vacation home in Wisconsin, where the forests do indeed have leaves piled thick and deep. You get the picture, though. There's something earthy to her work, a feeling of decay that isn't the dull stink of death, but rather that continual recycling of life that is the forest itself. It's not just the hues and tones she chooses to depict her world and characters, each of whom is a vibrant individual that inhabits a rich, otherworldly, and yet absolutely human world of flaws and foibles; it's the overflowing details, the potent expressions on people's faces, the chaotic bustle of the city in which her story takes place, the festivals, celebrations and messiness of day to day existence laid bare. Well, there's monsters there too; Valta's world is full of them! Goblins, trolls, fantastic beasties and what have you. But these are humans in monster's skin; underneath all their warts and scales are worrywarts and depressed drunks. Delectably rendered in watercolor-like blotches, the stage is set at a magical social worker's office that deals with downtrodden magical folk. The counselor is a wizard. Who doesn't wizard, but from his scruffy, ill-kept beard to his limpid pools of eyes and long, flowing robe, it is an open secret hiding in plain sight. Which is to say it isn't hidden. He's a wizard. Who doesn't wizard. That said, dealing with disembodied heads of Trojan heroes, sirens whose siren song can't lure sailors to their doom, and an overly messianic plant-like being inhabiting the body of a cat must be considered some type of magic. Datura, you know. Takes you, rattles you up and shakes you to the bone. You'll see once you read the comic. It is within this world of monsters as people and people as monsters, that the grey area grows vast and you start wondering about what's truly human. And none of the protagonists in this series are as dear to the heart as our most magnificent guide to the human spirit, Valo. Valo is a conundrum that is wrapped up in a numbnut who is so totally crass and out-of-control, yet guiding one ever closer in to understanding what is at the root of being human. As one reads through the strip, Valo seems to stay the same but the direction we are looking at them shifts, revealing new facets as one rotates around a person who just can't help but being who they are, and being it very loudly. If you are enormously irritated with the character the first time you meet them in the comic, then Valo's done their job of being Valo. I won't spoil things further. The story is sinuous and organic, like a vine coiling around abandoned masonry out in the middle of a grassy meadow, and is worth being revealed through reading it yourself. 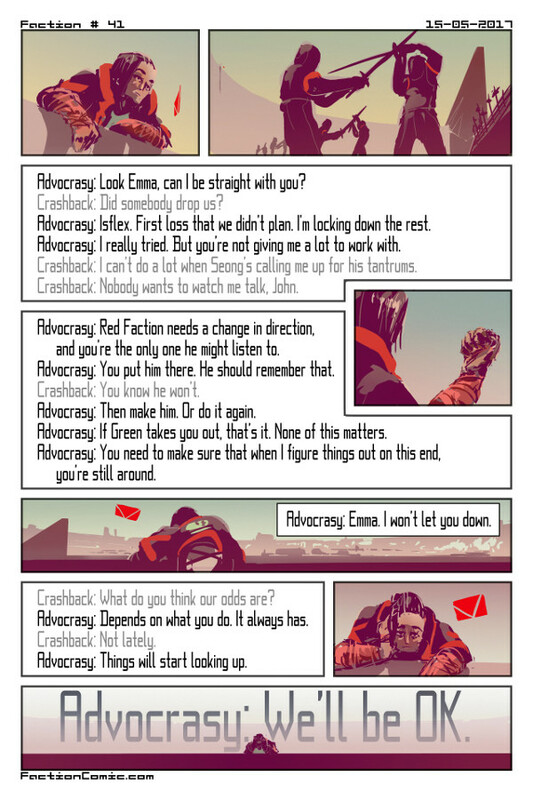 Several times illusion is called up in the comic, and these dream-like worlds that parallel the "real" world, like drifting clouds, are as mirrors to the psyche of the characters. But the way Sara Valta depicts her world is like a dream, with a romanticism for architecture and texture. Like a dream. That's where we touch on the true essence of fantasy. Fantasy is actually more complicated than just a dream, because it is conscious, waking minds which create the fantastic in art and literature, even if its root might be in the fertile mulch of the subconscious. Somehow, the seemingly irrational connections of our mind's undergrowth survive the waking process to become paintings, sculptures, sketches and poetry; whatever the medium used, the result is wild, unrestrained imagination. And it is there that Valta's visual story finds common cause with the Russian painter Marc Chagall. A recent exhibition at the Los Angeles County Museum of Art brought a lesser-known facet of this early Modernist's work to light; that of his work on costume and set design for ballets and operas. The exhibition, "Chagall: Fantasies for the Stage," was fascinating in one major aspect, as it showed how Chagall took his imagination from two dimensions to three. Graphite sketches filled out with gouache, watercolors, and india ink were his version of what we in the twenty-first century would call concept art. They practically sprang from his mind's eye onto the paper, so lively and lyrical are their poses! Yet, these were precursors to the final result; magnificent, crude, bold ensembles, cut from cloth, adorned with animal hair, papier-mâché, and other accessories, and finally painted by hand, courtesy of Chagall himself. These costumes depict maidens, beasts, monsters, fairy kings and queens, and those constructing them put in great effort to ensure they were faithful reproductions of Chagall's initial designs. Oh, to see these magical creations worn in real life, dancing about the stage! Chagall's creatures would not find an easy box to fit into, using today's tropes and categories. They are fantastical, yet one would be hard pressed to label them fantasy, as we would define them using contemporary fiction's world of orcs, elves, dragons and ents. Fantasy nowadays is a bit of a straitjacket; born from J.R.R. Tolkien's seminal epic, itself influenced by Norse ancestry, married to a twisted and tweaked interpretation of the Middle Ages, most everything we call fantasy is set to a certain rhyme, iterations of a time half-remembered, but reimagined. In a way, it is a method of making sense of our past. Orcs, goblins, bugbears and other dark entities represent the other; cultures which we may have seen as alien and frightening. Elves are manifestations of the exotic; distant, unreachable, yet desirable. Dragons, of course, are the wild, untamed power of nature, the beast unleashed. Imagination uses metaphors as the language with which it describes reality, and fantasy is modern day memory (just as science fiction is our way of contemplating the future). But dreams draw from a different well. Dreams do not have to make sense, and indeed often don't. You can argue about retcons and inconsistencies in the stories of Middle Earth, Warcraft, and Game of Thrones, but the primeval power of dreams cares not for continuity or logic. When we talk about fantasy as the mainstream genre, this power does not figure into the discussion, except for the bare threads of discord that creep into it from the most gifted dreamers. Fantasy as imagination, is about what inhabits the realm between the conscious and the subconscious. That is the thread that weaves together Alchemilla and Marc Chagall. Chagall's costumes, and the seeds behind them, are such a madman's stitch of reality and the fantastical that it is hard to discern which came from where. But sometimes, the lines are there. Chagall's time in North America, as well as Mexico (which for obscure labor union laws he visited in order to paint the backdrops for his operas) must have suffused him with inspiration. In his costumes for the Firebird, you can see how Native American katsinas, such as the Squash Katsina, were recalled in his imagination to become the monstrous servants of the dark prince, Koschei. Another "monster", with a black, domed head, replete with multi-colored polka dots, is so similar to the Zuni Kokoshori (loosely translated as Firewalker) Katsina as to be indistinguishable. These spirits, so artfully depicted by generations of Native Americans, lit a sympathetic fire in Chagall's heart. Russian folklore is full of similar creatures, gods, witches and ogres, and to him the fraternity between the two cultures was clear. He paid homage to their brotherhood by bringing their deities to life in what was to him a contemporary creation of myth. There is no great degree of separation between mythology and modern fantasy. You could argue that they are the same thing, just from different eras, one being the ancient past, the other, the present. Yet there is something missing in much of today's fiction. A crucial element, a missing link, something which deadens the art despite having more special effects, more grandiosity, more oomph and wow and pizzazz than we have ever had in our stories, and that is imaginative thinking. Imagination is qualitatively different from what we currently have, which is imitation. Imagination is the mind's willingness to let go, and to walk into uncharted territories. It is where the constraints of logic and reason are relaxed, and more subtle connections are explored. Imagination is not without its own rules; it does not come from nothing. Indeed, it is drawn directly from experience. The alchemical transmutation that occurs follows lines of relation that our conscious mind cannot fathom, but which exist nonetheless. This is the wilderness that Chagall so passionately inhabited, and which in her own way, Valta speculatively investigates, as carefully as a gardener, planting seeds which bear growth as dreamscapes and ghosts and divine entities. At the same time, her comic Alchemilla is so very grounded in the human world. Its characters deal with issues as mundane as a janitor grumbling as he cleans up yet another mess, of skipping work or running away from home to find a moment of sanctuary with a relative stranger. Chagall worked in the opposite direction; in a time where the chains of reality were closing in, when the industrial age was making man into machine, he sought to liberate the mind from its bonds, giving us vast playgrounds that verged on the nonsensical. Though their approaches differ, each shares a rare gift to those of us seeking the mysterious in life. You can read Alchemilla here. Start at the beginning. Though now closed, you can visit the exhibition page for LACMA's "Chagall: Fantasies for the Stage" here. Further reading: Kimberly Chrisman-Campbell's exhibition review in Ornament Magazine. Julia Felsenthal's 2015 review of the show at the Fenimore Art Museum in Vogue. A historical overview of the LACMA show by Discover Los Angeles. We currently live in an era where disconnection and outrage makes us feel isolated. In spite of our newfound ability to be in contact with friends and family at practically any hour of the day. Why? Because all of the noise that is to be found through that same vehicle, whether through Facebook, Twitter, Reddit, or the news, has led to a deep fear that there is a "they" out there, who are not us, and who are beyond the reach of reason. Whichever side of the divide you're on, the same fundamental anxiety exists. There's another reason why being more "connected" has led to less connection, and that's so simple that it shouldn't have to be explained; human beings need to see each other face to face. No matter the volume of texts that you might exchange with a friend or loved one, it's all robotic fairy dust compared to actually spending time with them. Of course, for those whose friends and family are out of state (or out of country), this new digital communication is a godsend, and one that I find much solace in. But it should be an additional tool, rather than, as has been the case for many, the primary one, in our box of tricks for being human. That's where localism comes in. We're very fortunate to live in the era we inhabit, because we have at our fingertips both the benefits of modern technology, and a relatively safe country that is filled with wonderful people. Sometimes with all the noise it's easy to forget that. Localism is a very simple concept. Find people in your neighborhood and start meeting with them. Talk over dinner; chat over coffee, go play some sports together! This is putting a new name to a ridiculously old thing, and I apologize for restating the obvious like this, but it seems like in this day and age, it needs to be said again. Slow down. Meet people, new and old. Especially new. Stretch your wings a little. Expand your circle; I know it's hard, and if you're like me, that might give you heart palpitations (That's quite alright, sir/ma'am; step this way, we have a place for you in Introverts Anonymous). As a political concept, localism is more important than ever. Politics have been practiced for the last few decades in that infamous top-down manner that leads to disassociation between politicians and constituents. The best politicians overcome this by staying in touch with the people they were elected by to represent, but we've arrived at the point we're at in this country because our organization as a people, of American citizens, has been fragmented. The solution is to bring all those fragments together, and to raise the level of discourse to include everyone. Easier said than done, right? Well, yes, but it's not as insurmountable a task as one might think. If we assume we have to arrive at a full mobilization of the American people by this time next Wednesday, then yes, it's absolutely impossible and I think we'd all go into conniptions over the prospect. Putting aside unrealistic goals, though, localism is probably the best way out of this mess. Even better, it's fun. If you've got a bee in your bonnet, take the political interpretation of localism and run with it; I'm not stopping you! But localism is just a fancy word for making friends, and being with friends. That's something I'm sure we could all use a little more of, nowadays. For the higher thinkers out there, localism can be applied to the internet using something I call the digital neighborhood. This is part of the reason we're so lucky to be alive right now; people we might never have met, who we can relate to, joke and laugh with, and find amazing in their own way are no longer strangers. We can make friends all over the country, and the planet, through the internet (or, as the case may be, in our travels), and the world wide web lets us stay in touch with each other. The digital neighborhood is, you guessed it, a fancy word for community. But it has a few nuances to it. The idea is to gather like-minded people, who enjoy each other's company, and putting the tools in place so that community can have a central forum to communicate. We're actually in the Wild Wild West out here on the digital frontier. There's no set rules in place, and while structures have come and gone (RIP Myspace), it's still in our hands to invent what the internet is for. One of those uses, I propose, is to make it so members of a community, of that digital neighborhood, can help each other out. Or, perhaps more importantly, just have fun together. Organizing ourselves into digital neighborhoods allows us Gen X'ers and Millenials to start the foundation of a new world that, at its best, allows us to meet face to face while keeping the advantages of instant communication through the internet. Want to take your digital neighborhood on a trip to India? Float the idea around, see who's interested. Fundraise. Plan things out; maybe there's someone in your group who's particularly good with finances, but not so much with scheduling. Not to worry, old Fred is ace at that. At its worst? You'll have a group of people who are stuck to their phones and not getting out into the real world. If you really want to get into it, digital neighborhoods are a way of reconnecting. Let's say I have my digital neighborhood, and you have yours. Perhaps your community and mine aren't so different. We might not completely overlap, but we dig each other. Community to community, we can hang out, host parties, and maybe some of us will even become friends. Have your people talk to my people, I'll call on Monday. That might be a rosy outlook, and I am quite aware that not all of us will get along with each other. However, in trying to address the lack of power of the average person, politically and otherwise, digital neighborhoods (and localism) seem like a pretty good thing. Look at it as kind of a Venn diagram; communities that are cool with each other will overlap, communities that aren't will stay separated. As in politics, sometimes we need to cooperate to achieve certain goals, and that requires us to be organized, in touch, and being able to trust each other. While we have got a long ways to go on that front between political parties, as people, we can begin that now, and have some (or a lot) of fun while we're about it. Because that's what it's all about, when it comes right down to it. Katsinas by Manuel Chavarria Jr. The tallest katsina in the middle, with the crook, is an ogre katsina. During the children's festival, they chase young boys and girls (as well as adults), and if they catch them ask for a ransom from their parents. The ogres are a life lesson that family is important, and that there are certain things in life you must stay away from. Native art has always been about reconciling new influences with maintaining a lineage from past to present, and into the future. Tradition is respected because it is both one's history, and identity as a people. Within the bounds of tradition, of the lessons passed down from great grandfather to grandfather to father, and from great grandmother to grandmother to mother, there is a line that ties everything together, a collective memory that gives form and substance to life. 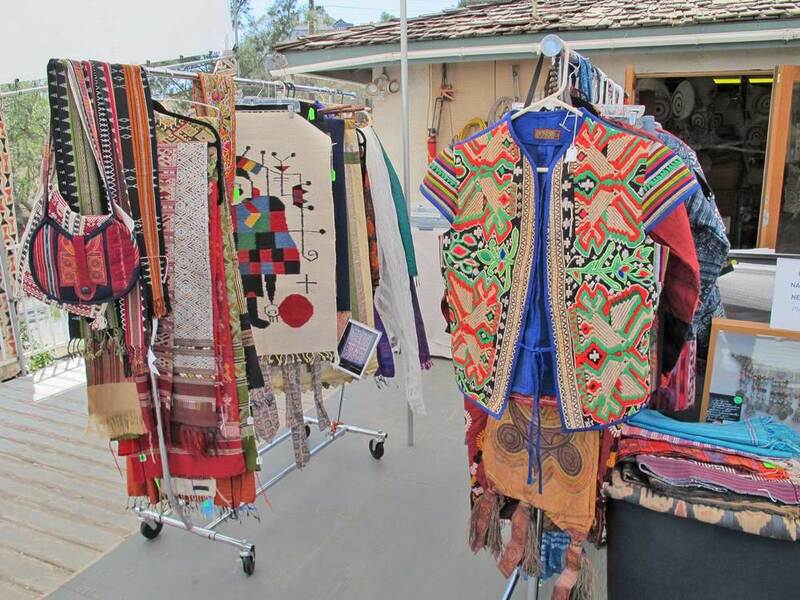 The vitality of that living tradition was on full display at the Heard Indian Fair & Market this March, 4 – 5, in that crossroads between cultures, the sunbathed urban expanse of Phoenix, Arizona. This was the best year I have ever seen at the Heard Museum. Despite the strife and unease that permeates our nation (or perhaps because of it), there was a sense of brilliance in the work on display, an energy that presented itself through an originality of design and composition, a keen and precise craftsmanship, a wide diversity of media and most important, a feeling of renewal, of a new generation of iterations growing from some root or trunk that was much more ancient. The synergy between experimentation and tradition has never been greater for Native art. The Katsina carvings of Manuel Chavarria Jr. are proof that there can be a great spirit thriving within age. He is a Hopi artist who fashions very traditional katsina dolls. Katsinas have evolved much as they have become objects for sale to White customers, where katsina carvers, with modern tools and materials available to them, push the art form into magnificently complex and vibrant sculptures, often seeking to outdo themselves by whittling a massive, foot-and-a-half high katsina, poised in song and dance, from a single piece of wood. In older days, though, katsinas were much simpler. An effigy of the spiritual being they represented, the makers of centuries past breathed life into their creations by carving vestigial limbs, etching out of the wood the barest necessity of detail needed to show a skirt, reveal a cape or depict a leering grin. Time was a resource to be invested wisely, and that bred a style of katsina where minimalism and symbolism provided all the vocabulary one had to express one's self. Manuel takes this tradition and furthers it with a careful touch and a lyrical witticism. His use of vegetal and mineral dyes, which he applies sparingly, lends a wizened quality to his miniature beings that makes them feel as if they are much, much older than they really are. Now, actually that is not quite true. The spirits that he is making vessels for are as old as the world itself, but in his hands perhaps one should say they are as young as the world. A cheeky bending of the waist, a tilting of the head, bug eyes staring out bright as the headlamps of a truck in the desert, knees and elbows crooked at just the right angle, Manuel's dolls are playful, inquisitive, and attentive. Raven Mask (name not known) by Jason Reed Brown. The chain links which Jason incorporated into this piece add a mystical aural component, and is a decorative element he employs in some of his other sculptures. I thought it was interesting because Siberian shamans are supposed to have an iron chain tied to their ceremonial vestments, so that in an emergency they can be dragged out from the spirit realm, with the metal chain serving as an anchor to the material world. When diverging from the traditional ways and materials, Native identity becomes a complicated subject. Somewhere, there is a line across which one is no longer making "Indian" work, unrecognizable, a cessation of that thread that has been unbroken since days long ago. The flip side is being stereotyped. Handling the balance between those two edges, and having innovation and tradition comfortably coexisting together has been a difficult path for many Native artists, particularly younger ones, to navigate. These last few years, and 2017 in particular, has seen that process of experimentation, of going to one extreme and then pulling back, come to a magnificent result. I saw more artwork at the Heard Fair than I ever have in the past years of attending the show that illustrated a natural ingenuity. Unforced, unpretentious, but different, original, playing with old themes in new ways; that was what made this year's fair so exciting. The forged steel sculpture of Jason Reed Brown, a Kokuyon Athabascan blacksmith from Alaska, brings forth one of the best qualities of modern Native craft; a faithful reinterpretation of old ways with new materials. In many ways, Native art has always been a reflection of one's environment. The materials used to create it were gathered from grass, brush, wood, earth, bark, sand and stone. The symbols and creatures it depicted were gathered from one's surroundings, the local wildlife, the spirits that dwelled within rock and tree and river. Native Americans for the past few centuries have had to go through a period of intense struggle as that environment changed around them. Now for many, instead of the gentle expanse of nature and the quiet havens there is asphalt, concrete, noise, smoke and metal. Jason, like many youthful Native artists, have tackled this strange new world and wrestled from it the one purifying action for any alien landscape; rendering it into objects that are recognizable and have meaning. He hammers steel into bold, archaic statuary, totemized animals and spirits that use the same vocabulary of shapes, formlines, ovoids, U forms and S forms, as the Northwest Coast art of olden days. However, the magic touch is his inclusion of the original soul of the steel, recycling rivets as eyes, using checkered plate as textured skin, integrating old industrial grips as a fish's fins or Raven's piercing gaze. The beauty of this re-use is clear. What was old, discarded, dead, forgotten has seen the light of a new day in this spiritual transformation, a rebirth that sees the valueless becoming valuable, that which was aimless now full of power and intent. It is utterly magnificent. Salmon I by Jason Reed Brown of steel and copper. In Manuel Chavarria Jr. and Jason Reed Brown, we see two poles in contemporary Native artwork that has common ground. Both have the ability to innovate on tradition in a way that respects the past, while keeping some essential spark that makes their work feel alive, wild, and free. That spark is called honesty, and can be found anywhere that the process is elevated above the desired end result. Native American art and craft is currently experience a surfeit of that creative force, and the results speak for themselves. Jason Reed Brown's work is at hammerhandforge.com. Manuel Chavarria Jr. you can find either on Facebook, or if you google his name you can find a few galleries which sell his work. Front and back of Hummingbird I sculpture by Jason Reed Brown. I'd originally thought it was like a totem pole, a tripartite stack of bird, animal, and fish. Perhaps that's what a hummingbird actually is. Did you ever open up the Sunday newspaper as a child (or as a child-like adult) and skip right to the comics section? Back then they were had quite a few nicknames attached to them, but I always called them the funny pages. I would read them for one reason and one reason only: to see Calvin & Hobbes, in print, in their full, gray-papered glory. Alas, I was born too late for that to have been a long-lived habit; indeed, Calvin & Hobbes stopped syndication just a year or so after I realized they were actually in newspapers and not just the comic books my parents bought for me as a kid. Ah well, c'est la vie. As it turned out, I came into the world at just the right time, as an entirely new genre of illustrated stories was on the verge of being realized. The Internet, that filthy newfangled thing which was leading to the demise of newspapers and print (except not really), had provided an open platform where anyone who could draw, write, and had some knowledge of photoshop could put together their own comic series. Webcomics were pioneered by an array of young artists who had a story to tell, and finally a public canvas where they could tell it. 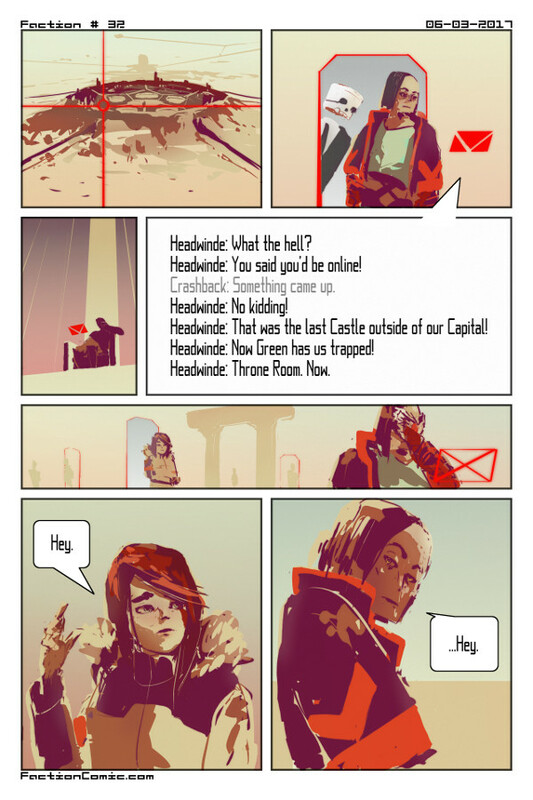 The best part of it was, for the artist and writer, one only needed about a hundred bucks in hosting fees to have a website on which they could post their webcomic, and for us, the avid readers of the times, it was free! Gloriously and completely free. It was as if the funny pages had returned to us, except this time we didn't even need our parents to purchase the Sunday newspaper. There is an interesting distinction between when one has to be self-motivated, and are entirely responsible for your own output, versus working in the structure of a job where you are making something for someone else. I happen to believe that there are upsides and challenges to both, but qualitatively one leads to a different set of stories than another. In the latter case, one is essentially working under a mentorship, and a pre-existing intellectual property; fancy words for another person's narrative and universe. You write underneath that umbrella, and while you can branch out, you are always creating within that framework. What was so exciting about self-made webcomic artists was that the tales they had to tell were all from many different universes. Some of them were very relatable; not surprising in the least, as they were written *by* people just like us. Megatokyo spoke to every teenage anime gamer geek, and popularized esoteric terms to the mainstream such as l33t (a reference to elite, as in an elite gamer, a word that has now become hopelessly obsolete) and otaku, the Japanese word for fan that generally meant someone who was a fan of manga and anime. Those of us who were looking for a cool nerd role model finally had one in the form of Largo, a Don Quixote-style badass with a clownish sense of humor who played the extroverted counterpoint to Piro, the introverted, socially awkward harem-anime style protagonist who somewhat predictably entered into a romance with a robot girl. Megatokyo found itself, after some artistic disagreements between the co-creators, to head down the path too often traveled, with a focus on a single protagonist and a storyline that was nigh identical to the dozens of romantic dramas and comedies that Japan produced in spades. That's a matter of opinion, but the spark, of two characters who each had their turn in the limelight, was what drew me to Megatokyo in its early years. It is the escape from tropism, from that which has been hashed and rehashed, which separates webcomics from the comic book world. In some odd way the gravitational mass of previous stories makes it harder for the grand duo, Marvel and DC, to come up with something that seems genuinely novel. I attribute that to the fact that many of their stories have to do with superheroes and villains. It is fundamentally about some type of larger-than-life conflict, and while that can make for a lot of entertainment, it also makes it impossible to tell stories which are not oriented towards good versus evil. The webcomic world, in its creative freedom was limited only by the imaginations of its writers and artists, and their necessity of having a job on the side to support their narrative-creating alterego. It ain't all violets and roses, let me tell you now, and the lack of quality control makes for many comics that have either sub-par stories or artwork, or both; but having to wade through all the prenatal storytellers to get to the gold is worth it. We have a vast world as the playground of our imagination now, and it's all thanks to the internet. There is something in the air nowadays. A new generation of jewelers are finding their stride, and the results bode well for the future of contemporary art jewelry. Several of them found their wings under the masters of the current generation. Although they learned from mentors with a very developed style, these young jewelers have found a distinctive voice and separate identity which is marvelous to witness. Sara Owens is one of these, and her impeccably forged metalwork and use of quite peculiar found objects makes her one to watch. Owens apprenticed with Nancy Worden; both are Washington State residents. Worden is famous (some might say infamous) for her provocative mixed media jewelry which strives to make and communicate statements that cause a rethink about taboo subjects. Her meticulous metallurgic skills combine with teletype, old photographs, and a wide variety of society’s detritus to create jewelry with a feeling of antiquity and age, as if from an earlier time. This is her voice. Owens herself is on quite a different path, one which speaks with its own pitch and rhyme, and is embellished with immaculate technique and surprising secret materials. The bread and butter of Owens’s work is in exemplary hot- and cold-worked sterling silver, oxidized or otherwise. Her staple pieces, so far, are pumpkin, pear, and caterpillar-shaped earrings, featuring strips of silver curved into gently holistic ensembles that are pleasing to the eye both on and off the body. The darkened steel look of the oxidized silver makes them a good contrast for lighter skin or white clothes. She also makes pure sterling silver rings that are two conjoined half-spheres, merging together like amniotic cells, but with a sharp flat plateau that gleams like a mirror. A simple curved wire completes the piece, forming the mount for one’s finger. With a few small indentations, there is the feel of a salt and pepper shaker, and all together the solidity of the design feels very immediate and powerful. Again, Owens’s ability as a metalsmith are eminently felt in all of these pieces of jewelry. Novelty in alternative materials is a big thing in the contemporary art world. Often, the shock factor is perceived as quality, but this wears off once something becomes passé. Now, when you hear about pig femurs and coffee filters, the more jaded among you might have the same feelings pass through your mind. “Oh, more shock value. More mindless entertainment. More titillation.” Thankfully, with Sara Owens, nothing could be farther from the truth. In her hands, coffee filters becomes a form of papier mache. Molded into disks, or as the skin for a rubber bulb, they take on the quality of bone and handmade paper, organic yet also not, a gorgeous contradiction in terms that renders it endlessly fascinating to the eye. One brooch pairs those bone-skin disks (stretched over the plastic tops of spice shakers) with a wire mesh top, which might have well come from a tea strainer, trailed by white and black strands which fall like a wild veil of stinging tentacles. Dark, light and silver are an easy arrangement of color theory, but seldom is it accomplished in such a complex expression. Now, for the pig femur. In pendant form, it is a little difficult to recognize, particularly as Owens pairs it with a ball joint metal figure which keeps one’s attention from firmly grasping the identity of the skeletal component. In fact, both mirror each other, one formed from inorganic metal, the other from formerly living animal. The two orbs echo each other, demonstrating that Owens’ grasp of design equals her innovative selection of materials. A large, almost rectangular blackened metal wire loop attaches the would-be pendant to a necklace, and two pronged projections, like orthopaedic surgical attachments, marry the bone to the metal. Her pieces range from lightweight to sizeable; heftiness is an attribute of several of her pendants and rings that is derived from a solidity of construction. They feel weighty, firm, and well-made. These feel like industrial parts, but refined and rendered unto elegant form. Engineering but with no clear purpose, except, perhaps, aesthetic expression, abounds in Owens’ jewelry. Engineered. There is an enthusiasm to Owens’ life with her husband that seems to transfer “personal responsibility” to everything they do. With the help of friends and family, they recently built their own small house, entirely from scratch, in wooden construction but high tech amenities, such as heated benches. (Well, not high tech; rather, cleverly made!) By having a hand in what they eat, what they make, and where they live, Owens assumes a level of personal responsibility over her life that she seeks to see reflected in the world around her in terms of social justice and environmental issues. With her simple but complicated minimalist aesthetic and passionate dedication to doing-it-yourself, this young Washingtonian is part of a new generation of skilled and expressive craftspeople who bridge tradition and the contemporary. Pacific Artefacts is a little known treasure hiding deep in the heart of Vista. Although those outside of North County are unlikely to understand the deep, twisting suburban jungle which makes up that city, for those in the know you will see why this pacific island trading post could not be more ideally situated. Once a year, Lesley Martin hosts a little dine & market at her home. The event this year took place in early June. A number of vendors who know Lesley set up shop and exhibit their wares, filling the house and the outside with impromptu booths featuring exotic wares. Pacific Artefacts is the ethnographic distributor and folk art trader established under Lesley, which specializes in Papua New Guinea artifacts. But during the evening of her open house, there is a merchant of African masks, a Miao clothing trader, a seller of Burmese boxes, and more besides. The spectacle of the event becomes a bit otherworldly when all the tribal merchandise is involved as the backdrop. Vista is somewhat of a jungle in any event, with numerous nurseries and a decidely botanical aspect, and Pacific Artefacts feels like it is in the eye of that storm. All of this comes together into an out of this world experience, particularly if you have any interest in ethnographica. What Lesley has set up is more or less an international bazaar in the suburbia of Southern California. For those in the know, one or two astute buys may be purchased here. For anyone else, if you enjoy talks amongst the anthropological intelligentsia, you will probably find a number of the well-traveled, spotted with academic researchers and other devotees. A variety of African masks, buddhist art and other sculpture in the collection of Geoffrey Logan. The items for sale are as incredible as the people attending. Most if not all of the objects being shown are genuine artifacts, and each vendor is somewhat of an expert on ethnographic art in one field or another. That means to the best of their ability they’ve tried to correctly document and identify their wares. For those with solely an aesthetic eye, there’s a number of wild and zany clothing, beads, necklaces and other items that are sure to catch your attention. Having recently seen an exhibition on masks from Sierra Leone and Liberia, I was able to recognize one mask as a Liberian Dan mask, from the collection of Geoffrey Logan. For me personally, African masks are rather fascinating, and as I’m starting to explore the subject I can see there’s a vast variety of lineages and styles which compose the subject. 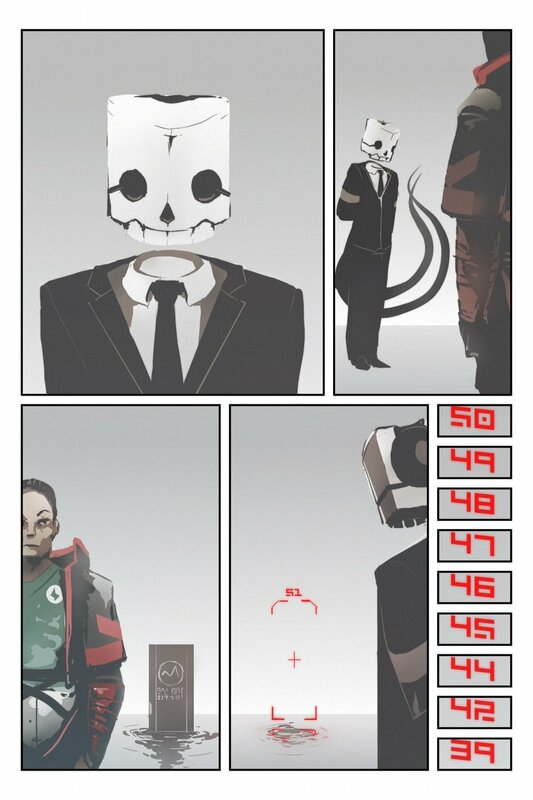 Although I’m not personally attracted to the aesthetic seen in the Dan masks, there were other interesting mask styles that I was drawn to. I thought a tan-amber hued mask, with small mouth, scarifications, and hooded eyes was quite quixotic and well-executed. The mask came from the Baule culture. The Baule are a member of the Akan people, who live across regions of both Ghana and the Ivory Coast. From what few categories of African masks that I’ve seen, I’ve felt the most affinity and appreciation for the craftsmanship and stylization of features seen in Sierra Leonese society masks. Personal familiarity aside, most of the objects for sale here are alien enough to warrant fascination. Pacific Artefacts own considerable stockpile of Papua New Guinea masks and sculptures is a rather amazing collection in and of itself. Great wide-eyed masks with a protruding mouth reminiscent of a giant duck’s bill, these painted leviathans are visually impressive. Whether one wishes to just peruse in solitude, or find some human interaction with fellow world travelers, this open house is just the thing. A small investigation of this little micro-cosm within a microcosm, this sequestered station of global tribal cultural art, is enough to reorient one’s sense of the world. Particularly if you are a resident of North County or San Diego. You are transported to a parallel place, both near and yet so very far away, where history of the lives of tribal folk, in art form, are standing in front of you, and some of the more discerning selections of that to boot. It’s a connection to a different realm, having an object made in some other part of the globe, without artifice. While there are a few of the more touristy items, by and large the collections at the open house have a decent, genuine selection of garments, objects or sculpture. Or masks! Or deeply frowning faces! Beaked nose masquerades stare hauntingly down at you from on high. Exquisite and unusual is the byword. With the current world climate of globalization changing and even ending many tribal and folk culture’s way of life, the art and crafted objects they have traditionally produced for tens or hundreds of years is being lost. A coexistant relationship between the first world and the fourth world, the world of tribal peoples, needs to be established, to provide a structure that will allow these people to continue their traditional way of life, while having access to modern technology as they deem it worthwhile to interact with. Ultimately, the ability to respect those ways of life and traditional land of the surviving tribal and folk cultures in the world helps preserve both knowledge and diversity. The method I would think best is giving each tribal society a few assistants, either outsiders who are well versed in their ways and act as intermediaries, or younger tribespeople who have been exposed to technology and/or the modern urban way of existence, and have still elected to return home and live a traditional life. These people would have the knowledge and capacity to use a computer and other basic, useful appliances, and be outfitted with them. They could barter a few modern goods across, to distribute among the tribe, if it was seen by the tribe and the traditional elders as a useful thing. The intent is not to keep a tribal society locked to old traditions; if that’s the case, that society can easily be assimilated into urban society. The intent is for those tribal societies that actively wish to preserve their way of life, a path of preservation is given, where their minimum requirements and more are met, and they are provided with a contact to the modern world. This will hopefully allow tribal cultures to integrate into globalized society with their identity, history and knowledge intact. I’m sorry for that tangent, but in fact it does have something to do with Pacific Artefacts and friends. They provide a cultural lens, an anthropological telescope, into the lives of tribal cultures from the world over. While there are problems with commercializing another people’s culture, as is the result with tourist art, a proper medium way allows for an exchange between worlds, for example that of Papua New Guinea and Vista, California. And possession of the art with an appreciation for the art results in an appreciation for that culture, and a window into their world. For those seeking a little bit of the otherworldly in their life, and not minding a bit of a trek to get it, come to Pacific Artefacts. Evening light casts its beautiful glow on Lewis Street. 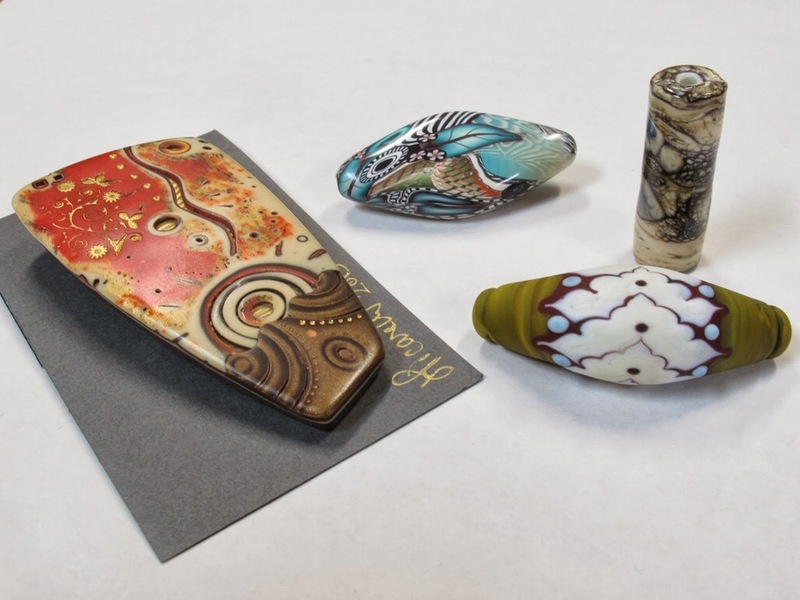 Taboo Studio, in San Diego's Mission Hills, is the city's primary fine jewelry gallery, displaying the work of craft artisans local and national. Small, cozy, and fielding several large narrow display cases which flank the gallery's walls, it is a venue eminently suitable for a substantial showing of art jewelry. The gallery has been going strong for twenty-six years under the auspices of its owners Jane Groover and Joanna Rhodes, who are jewelers themselves that regularly exhibit their own work nestled amongst that of their peers. In fact, Taboo Studio is a haven for local jewelers, several of whom work at the gallery, and a place for friends and acquaintances to lend a hand occasionally, serving as assistants for exhibition openings and the like. Myung Urso's multimedia necklaces, incorporating some sort of rubber/plastic and traditional handmade paper, or hanji as it is called in Korea, with acrylic paint. The piece behind it may be using wood for the broad rectangular shape. The gallery itself, besides its tall impressive standing displays, also requires a visitor to cast a quick glance to the floor, which is papered over from end to end with Japanese newspapers and sealed; a functional side-effect of an upstairs apartment which occasionally leaks, requiring floor renovation. The staff of Taboo have accepted this in stride, and as handywomen and craftspeople taken it upon themselves to inflect a touch of the quixotic on their jewelry's abode. Examining the show, one could find two or three essential similarities in approach to answering the exhibition's theme. One of these was focusing on gemstones, whether precious or semi-precious, to echo the exhibition's thematic color, usually embellished with silver or gold. Petra Class, a renowned lapidary artist and goldsmith, has recently been focusing on incorporating what could nearly be called obscenely large pieces of lapis lazuli in her distinctive gold frame enclosures. These pieces took a thin sheet of the semi-precious stone and rendered it as though it was a painting, glorifying the stone and inviting the viewer to thoroughly examine the irregularities and peculiarities of the material. Rather than being an accent and embellishment, the lapis lazuli becomes the focal point which the gold frame simply delineates for the eye. Of course, the deep cobalt blue color of the lapis was an apt match for the theme of the show. Lightning and thunderclouds, with a touch of sun, adorn Brooke Battles' enamel pendants. Cindy Sumner's mixed media rings utilize lithographed steel from vintage objects, as well as brass and wood. Another avenue of expression was through different materials rendered in the appropriate hue. Wendy McAllister and Brooke Battles took their medium of choice, enamel, and brought forth deep navy blues in their work through this method. Battles in particular had several pieces I especially enjoyed, from her enameled storm clouds pendant with cartoonish lightning bolts emanating therefrom, to her small mask brooches which evoked for me a mixture of tribal art and muppet-like zaniness. A handful of items in the exhibit gave the mere suggestion of sea or sky, rather than directly alluding to it through coloration. Cindy Sumner's pugnacious rings took scenic slices from imagery present on vintage tin containers and riveted them to silver or brass backings. Multi-layered, with black, white or wooden blobby shapes to create contrast, Sumner's pieces were a delicious insinuation of the quality of air and open space that was effective and subtle. 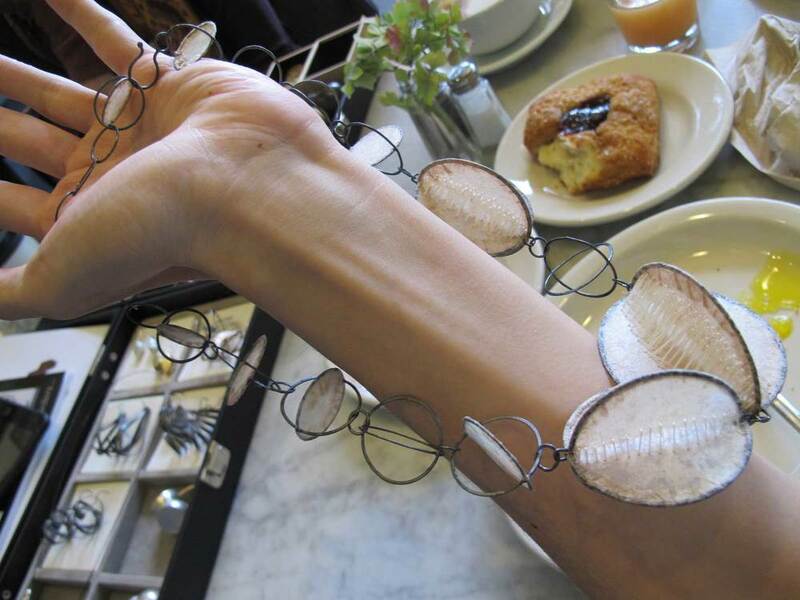 Gallery co-owner Jane Groover presents a piece of jewelry for a curious onlooker's appraisal. The light during the summer in San Diego casts a sublime effervescence in the evening hours, and against the backdrop of this enjoyable ambiance the reception took place. Drinks and snacks were spread upon the small table staged outside and manned (and womanned) by friends and staff of Taboo. Inside, guests and artists surveyed the loquacious ensemble and listened intently with eyes instead of ears. Not a few pieces were brought out for closer inspection, and the gentle murmuring of conversation that can be so pleasant permeated the air. Sydney Lynch's artistically arranged rings, using silver, gold, opals and other assorted semi-precious gems. Not a few jewelry heavyweights came out to attend the show. Longtime jewelrymaking educator Arline Fisch, a retired professor of art at San Diego State University, among others, and a pioneer of woven metal textile wearables was present, as well as the contemporary jeweler Hiroko Sato-Pijanowski, whose work is now on view at the Donna Schneier exhibition at the Metropolitan Museum of Art in New York. I also had the pleasure of seeing an old friend of mine, Reba Engel, who while not officially participating in the show is a longtime exhibitor at Taboo Studio. Her jewelry has a particular zing to it, something tribal, something beach, perhaps Californian, that I covet. Anyways, it was nice to catch up. I could go further into the evening's delight, but that's my personal story. Suffice to say, it was a pleasurable event, enticing to the senses, and companionable to the spirit. The show ends this July 3, 2014. I encourage you to go and see the exhibition yourself, and make an evening of it. National Museum of African Art, "Visions from the Forests: The Art of Liberia and Sierra Leone"
The jewelry in the show is quite fabulous, securing the keystone for a landmark exhibition. Though only a few examples, they are stunning ones, mainly because the choices were to find the most unusual expressions of Liberian and Leonese art. Clockwise from Left to Right: Polymer pendant by Julie Picarello of Yellow House Designs, polymer bead by Klew Expressions, glass bead by Michelle Davis of Tangible Light Studio, and glass bead by Terri Caspary Schmidt of Caspary Lampwork. Beads. Unless you grew up around them or acquired an interest in these small holey adornments, the mental image conjured up in your mind may well be neon colored round objects from Mardi Gras, or something similarly banal. Uninspired, pretty, uncomplicated. If however you’ve gone into the passion for collecting, or making jewelry from beads, you know how deep the rabbit hole goes.